81% Certified Organic. ORGANIC JOJOBA & MINT FACIAL. A lively-yet-soothing organic Jojoba bead scrub in a creamy, non-oily base of moisturizers. Cleanses and exfoliates without harming tender epidermal tissue, and leaves skin refreshed instead of dry. 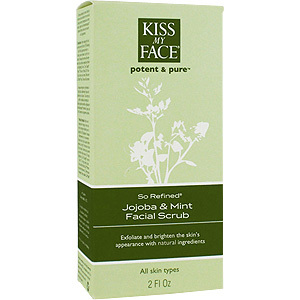 The SO REFINED facial effectively exfoliates with Jojoba beads, stimulates healthy circulation with intense organic Mint, and replenishes moisture with an abundance of beneficial herbs and restorative plant oils. The timeless, aromatic essential oils of Tea Tree, Mint, Eucalyptus, Camphor, and Bergamot are released as you massage, and penetrate deep into the skin for a radiant, healthy complexion. Jojoba is similar to the skin's own oils and helps to retain moisture. So Refined - is shipped in a discrete, unmarked package. Orders are processed immediately and usually take about 3 to 5 working days to be received. We do ask that you try it for 2 to 3 weeks to feel the full effects. Any information received is used only for order processing and shipping purposes. Your information, such as e-mail address, will never be disclosed to a third party.